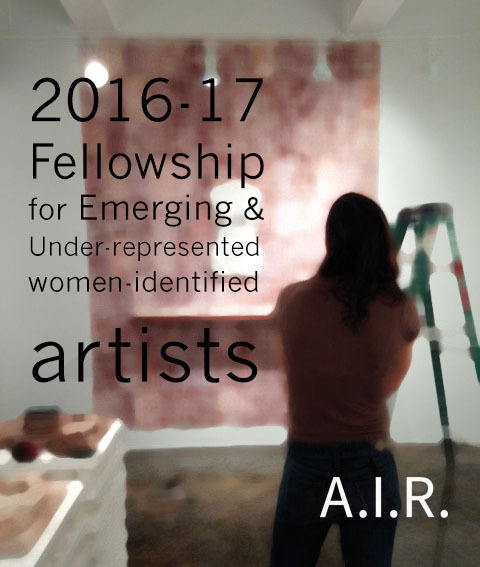 POSTED BY: info265 | Sun Sep 27th, 2015 4:27 p.m.
12- Month Professional Development Program and Solo Show Opportunity for emerging and Under-represented, self-identified Women Artists. Founded in 1972, A.I.R. Gallery is the first artist-run, not-for-profit contemporary art gallery for women artists in the country. As an early alternative space, A.I.R. served as a catalyst for the women’s art movement and a model for other artists and arts organizations. Building on A.I.R.’s historical influence on contemporary art, the Fellowship Program, a FREE 12-month intensive program, provides visible gallery space and an opportunity to establish relationships with experienced artists, art professionals and collectors. A panel of outside reviewers will select participants. Fellowship recipients will be assigned New York member liaisons and panelists are encouraged to visit the individual Fellow’s studios in preparation for their solo shows. In addition, recipients will plan and implement a community project with the gallery during their tenure. Selected Artists will be notified by APRIL 2016. Please do not contact the gallery to inquire about your application. •	Have not had a solo exhibition at a permanent commercial gallery in NYC in the last 10 years. •	Are residents, or within commuting distance of, New York City metropolitan area for the duration of the program. •	Not a student or enrolled in any degree seeking program at the time of the program. •	Not participating in a comparable development program or residency program. •	Not currently be a member, employee or board member of A.I.R. Gallery, and never have had a solo show at A.I.R. Gallery. •	Not a Fellowship alumna.